Mountain Mods is pleased to announce the release of the MM-Tektronix mATX test station. 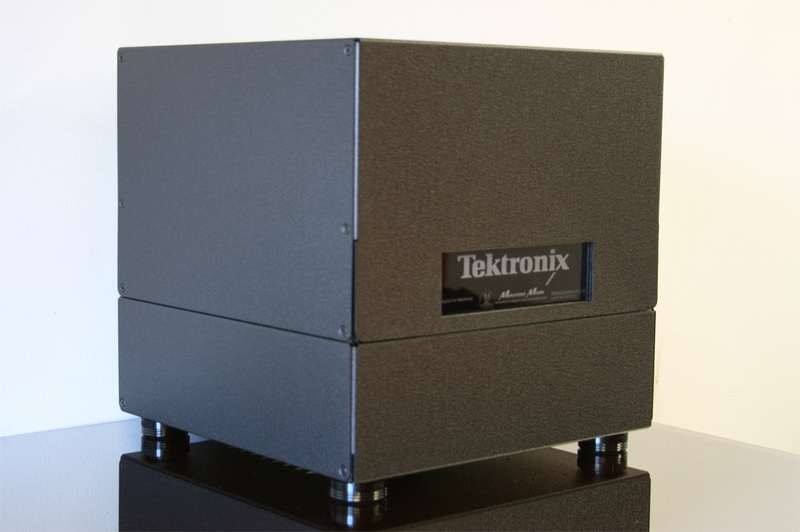 The MM-Tektronix mATX test station is a design and build request from Tektronix. Tektronix asked Mountain Mods to design and build a small number of demo/test stations to be used in the field. A relatively small, durable, and portable was required. The MM-Tektronix mATX test station is the result. The MM-Tektronix mATX test station is a rugged, portable 12-inch cube unit designed for use in a lab as a test station or for field use as a PC demo station for customer demos or tradeshows. The MM-Tektronix mATX test station allows full access to the mATX motherboard either for testers who want to quickly cycle through a variety of CPUs, memory modules and/or PCI Express cards, or for use at a trade show by a vendor to highlight their particular components installed in the mATX motherboard. Bottom Piece: holds ATX power supply, full-size DVDR/CDR drive and room for either two (2) 2.5 SSD or hard drive or one (1) 3.5 hard drive while the top of the base unit contains standoffs to hold a mATX motherboard with easy access cutouts along 3 of the 4 edges for all power and data cables. The motherboard tray portion can rotate 180 degrees so the I/O panel faces towards the front or rear (PSU side) of the case. The CDR/DVD cage can also be installed towards the front or back of the case. 2 sets of counter sunk mounting holes are implemented into the tray for installation of the CDR/DVD allowing for greater flexibility of use. Top Piece: provides a cover which is attached to the base unit by four (4) screws or thumbscrews for quick installation and removal and is designed to be installed to protect the mATX motherboard and its components when transporting the unit inside of a larger shipping container, i.e., foam-lined cardboard box or hard-shell transit case. A custom laser engraving is available on the front Lucite panel for a small fee. The MM-Tektronix mATX test station comes fully assembled and includes a set of 10 motherboard standoffs and mounting screws to secure a motherboard into the unit. 4 x 6-32 computer screws come installed into the I/O panel for installation of PCI(E) devices.